Marvelous Multiagers! : Snow Snow Snow!! Every time I go to write a new post, I click "New Blog" instead of "New Post"... just wanted to tell you that. So we FINALLY got snow in Chicago. I took a picture of our calendar area to remember the day. The weather person was SO EXCITED to choose "Snowy" as the weather for yesterday. Also look how close we are to 100th day! So last night, as the snow drifted from the sky, and the people on the radio assured me that there would be a snow day, I couldn't decide if I wanted one or not. I know that sounds weird. It's just that I had everything ready to go for today and I didn't want to push it back! Also I don't want to push back the 100th day party for logistical reasons!! But the plows were ready and we had school! 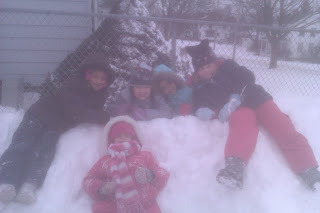 Here are some of my kiddos playing outside while I froze to death during morning recess. I swear those 15 minutes go slower than the entire rest of the day. Instead of math stations today (much to the chagrin of my students), we did this fun comparing numbers activity that I pinned from Mrs. Patton's Patch! Each student gets a white circle for each letter in their name. For example, I'd have 4 circles because my name is Jill. After writing one letter in each circle, they stack the circles up to make a snowman and make a few decorations. Then, they take a speech bubble and write a comparing sentence. 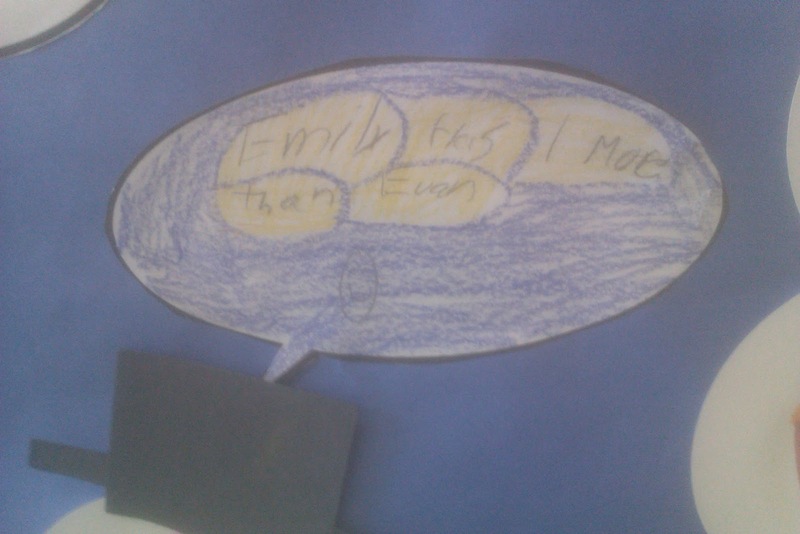 They compared any name to any other name and had to write something like, "Jill has 1 more than Jim." They were really into this! 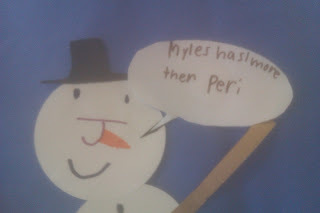 And this snowman cracks me up. 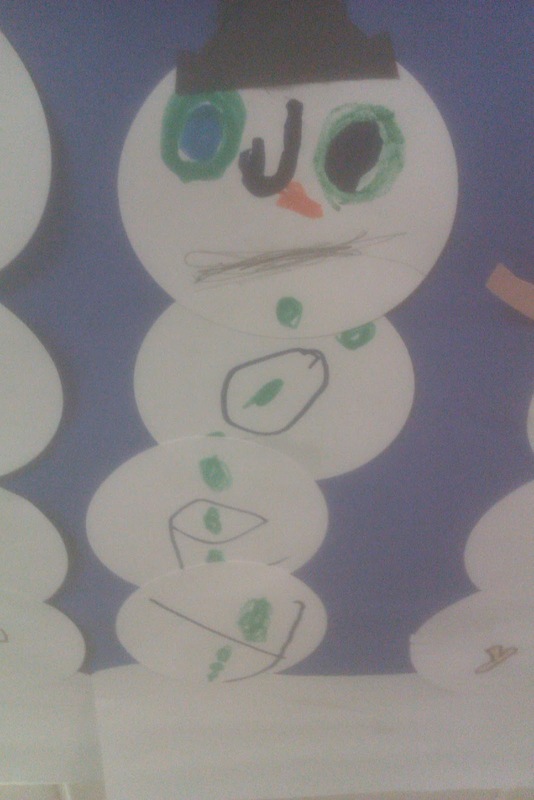 All of the other snowmen had huge smiles and arms, and this one looks a little disturbed. I was really happy with how easily they wrote their sentences! I only had to help one student with the "how many more" concept. Yay! 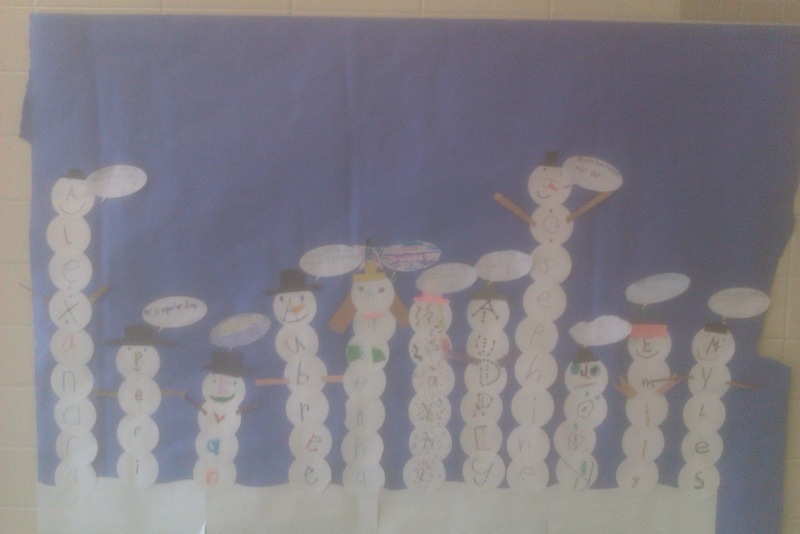 Your snowmen are cute! I pinned something similar on Pinterest a few weeks ago, but yours looks more like a bulletin board... I like it! Love to see the kids playing in the snow AT RECESS!!!!! My prinicpal wouldn't allow it. Sometimes we can't even go outside (even though it's sunny and clear) because of THE WIND. Seriously. I may just have to email this pic to her! Ha! And that math lesson looks so fun! This is so cute! 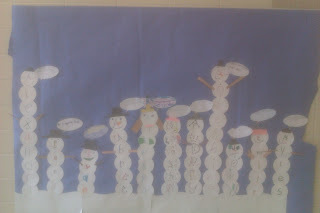 I love love the snowman activity. My kids are pretty good with one more, but get lost when I ask them 4 more, 5 more, etc. I think this would be really great to reinforce that! This is such a cute idea! I saw it on Pinterest and fell in love :) My first 3 years teaching, I taught a first/second multiage classroom also and learned a lot :) I look forward to reading more of your great posts :) Have a wonderful weekend!